Warm the oil in a large pan. Add the onion and a pinch of salt, then cook gently until soft. Add the tomatoes and chilli, then bring to boil. Simmer until the sauce is rich and think for 20 to 30 minutes. Add the basil in the last 5 minutes. Taste and add sugar if its too sharp. Bring a large pan of salted water to boil. Add the pasta and cook for only half the time advised on the packet. Drain. Mix the pasta with half the sauce. Oil and overproof dish. 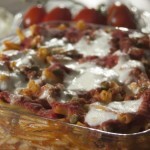 Make a layer with some pasta and sauce mix then zig-zag over a little more sauce. Layer mozzarella and a few basil leaves on top then sprinkle on some cheese. Repeat until all the ingredients have been used. Finish with a good serving of sauce topped with pamersan and breadcrumbs if you like. Bake at 180oc for 20 minutes and serve with a green salad. Pasta al forno 3.8 out of 5 based on 4 ratings.